I had the pleasure of visiting Cambodia for the first time recently, beginning with a fantastic week in Siem Reap. Being a huge foodie, I was so excited to try local Khmer dishes and eat my way around a city known for amazing food. As much as I love trying as many eateries as I can in a new place, I ended up loving five in particular that I regularly frequented over the course of seven days. Being 10 weeks into my Southeast Asian trip at that time, in Siem Reap I started craving really fresh and healthy wholesome food. I was temporarily chockablock full of rice, curries and noodle dishes. Enter visiting my first ever vegan cafe. I first heard of Vibe Cafe through travel bloggers Aggie Lal and Lisa Homsy (who happened to be in Siem Reap just before me). Their dishes they were showing off on their Instagram stories were exactly what I felt like, so off I went to Vibe on my first day for lunch, in search of some nourishing soul food. The cafe was modern, spotless and beautifully decorated, with two levels to choose from. The menu had so many delicious plant-based options, all nutritious, fresh and well balanced. 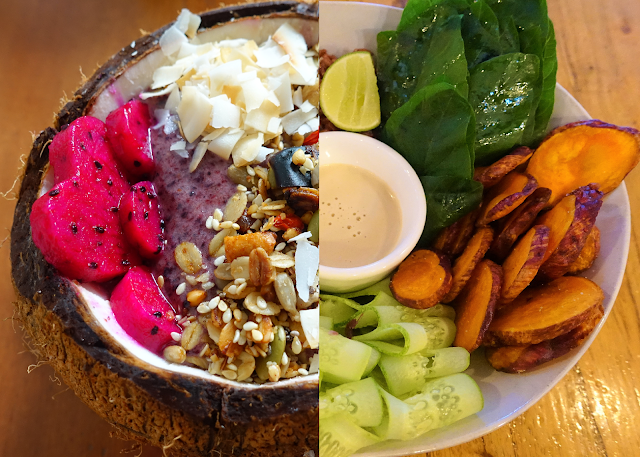 I ordered my first ever acai bowl with a fresh coconut and a side of sweet potato fries. Together, this was one of my favourite meals of all time! All of this came to only $10 US, which is a stunning price for such good food. I loved their message of 'Good Vibes All Day Every Day' and they donate 10% of their profits to the Good Vibe Foundation which supports the local community. On my second visit a few days later, I ordered the Raw Zucchini Pasta which was so nutritious and an explosion of flavour. I was incredibly full afterwards and basically super impressed with vegan food, I know I'm going to have it a lot more often now. My dinners, however, were reserved for trying local food only! 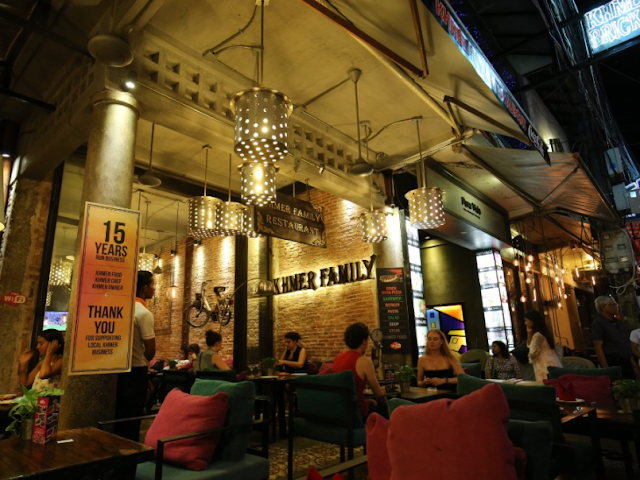 Khmer Kitchen is on a pedestrian alley that runs parallel to Pub Street. The tables spilled out onto the sidewalk and it was the full restaurant that drew me in. I ordered Fish Amok, a popular Khmer dish that I was very keen to try and it did not disappoint. The fish was fresh and the flavours were delicious. Despite being so busy, the service was very fast and friendly. Together with rice and a draught Tiger beer, it came to $6.50 US. On my second visit, I ordered the Khmer Curry, which was equally as good and very tasty. Sister Srey is another excellent and popular cafe I visited for lunches. They were also recommended by word of mouth and have a fantastic menu full of healthy and nutritious options. It was so hard for me to choose from all of the amazing choices (oh, how I missed avocado!) but I was very happy with what I had in the end. I ordered a fresh mango and pineapple ice blend juice and a Bodia Bowl. It was absolute perfection in a bowl and I felt so good for the rest of the day after eating such a healthy meal. Both came to only $9 US. The cafe was a great place to hang out and chill, it was bright and cosy, well-decorated and had a great atmosphere. The second time I ordered the same juice as it was so delish, and I had the stacked corn fritters with a poached egg which was a-maz-ing. Sister Srey helps and supports Khmer students and to make a sustainable impact on the community. They also boast the best coffee in town and have freshly baked goods (which I had to restrain from!). 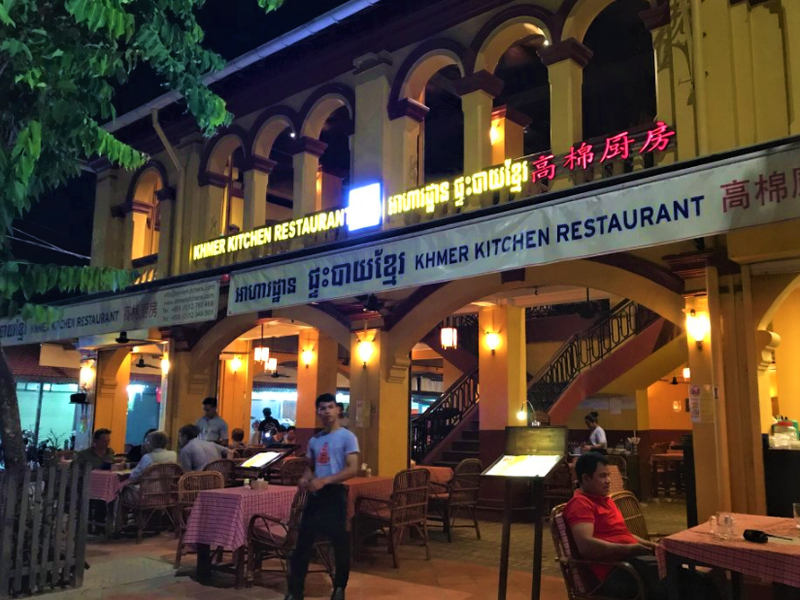 Located directly on Pub Street, I browsed around a few menus in the area first before deciding on Khmer Family Restaurant. Their prices were a lot more reasonable and it was a very large place and full of people. It was artfully decorated, with unique lanterns and bicycles hanging against the brick walls. My Angkor Wat tour guide that day had told me to try one of their traditional mixed spicy sour soups, so I ordered the Somloo Mjour Kreung. It was such an interesting mixture of flavours that truly tantilised the tastebuds. Together with steamed jasmine rice and an Angkor draft beer, it came to $5.75 US. They offer both traditional Khmer food as well as Western options and have daily drink specials including draft beer for only 50 cents. Walking around one day, I stumbled across this little gem, La Boulangerie, a French cafe. They serve French, European and local dishes. On my first visit, I was wanting to try another Khmer speciality - Beef Lolak and was glad to see it on their menu. It amusingly came out with french fries (not exactly traditional), but I wasn't really complaining! The complete dish was absolutely delicious, the tomato-rich beef was so tender and all together it tasted like I was eating a hamburger! That with a drink came to $5 US. On my second visit, I couldn't resist stopping by to pick up a fresh croissant I had spied in their cabinets the time before. There was no chance of me taking a photo, as down the pie-hole it went as soon as I left the shop. If I can add in a sneaky sixth suggestion, that would be to try the banana and chocolate pancakes from street food carts down Pub Street (at night only). They are made fresh, right in front of you and are the most delicious and indulgent dessert you can get for only $1 US. Continuing on with one final suggestion is a particular place that was great for a drink. The Sun was a perfect spot in the middle of Pub Street to people-watch and sip on one of their $1.50 US daily cocktail specials. 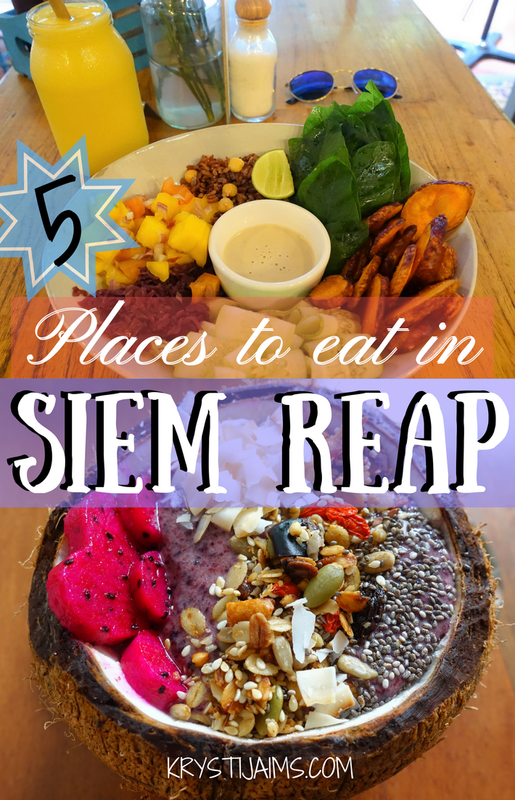 I hope you enjoyed my suggestions for great places to eat in Siem Reap and got some inspiration if you are heading there yourself! If you have any of your own to add, please comment below, I'd love to read them. As a side note, I always do food research online and browse through the best-recommended restaurants on Trip Advisor, and most of them in Siem Reap tended to be in the Old Market area and on the outskirts of the city centre. In this instance, I preferred to find places that were within walking distance to where I was staying, which happened to be close to Pub Street. The majority of places I walked into were chosen by their appeal at the time, by their menu, look and feel. I would love to go to Vibe. It looks like my kind of place to dine. Sounds like a lovely food adventure. It's amazing how inexpensively you can travel there. I've never been, but it sounds like an interesting destination. Thanks for sharing! Looks like a super fun adventure! Not sure I would be able to eat all of this if traveled but looks fun! Can't believe the prices, no wonder South-East Asia is such a popular destination, and I really can't wait to start making plans to go visit! These foods look absolutely delicious! I'm curious as what the pink thingy is? What a beautiful place! And, oh man! All of that food looks so good! Ive always wanted to visit Cambodia - the food all looks delicious, especially that soup - yum! the food looks incredible! i'm experiencing serious food envy :) amazing photos! i am literally drooling! love every dish here!! in the summer i have acai bowl almost daily! All of those places do look and sound like a lot of fun. But If I were to pick one, I would go with the Krmer Kitchen. I would really love to try some of that food out there. Looks delicious. Wow, these places all look amazing!!! Great finds!